Liked most of the other international students, I worked part-time in lots of different cafes, bars and restaurants during my studies to support my daily expenses. My very first job in the UK was working in a glamorous Chinese restaurant in North West London. The restaurant was quite famous and fancy in the area, and one of their most popular dishes was crispy duck with pancakes. It was almost like a must-order dish on the menu. 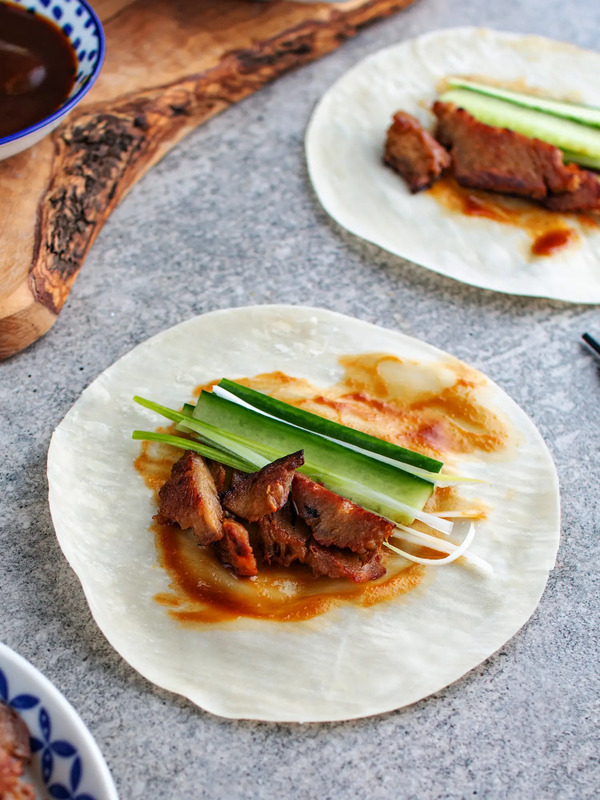 Peking duck is one of China’s most popular dishes, which is kind of similar to the UK’s well known crispy duck with pancakes. But in China, we don’t think of crispy duck and Peking duck as the same. The way you eat it may look similar – wrapping your duck in a pancake with salad and plum sauce, however, the method of cooking is completely different. It did take me quite a while to warm up with this popular British Chinese dish but eventually I started to really like it. Today I am going to show you how to re-create this very popular finger licking dish at home, vegan style! The easiest way to make this dish is to replace the real duck meat with mock duck. 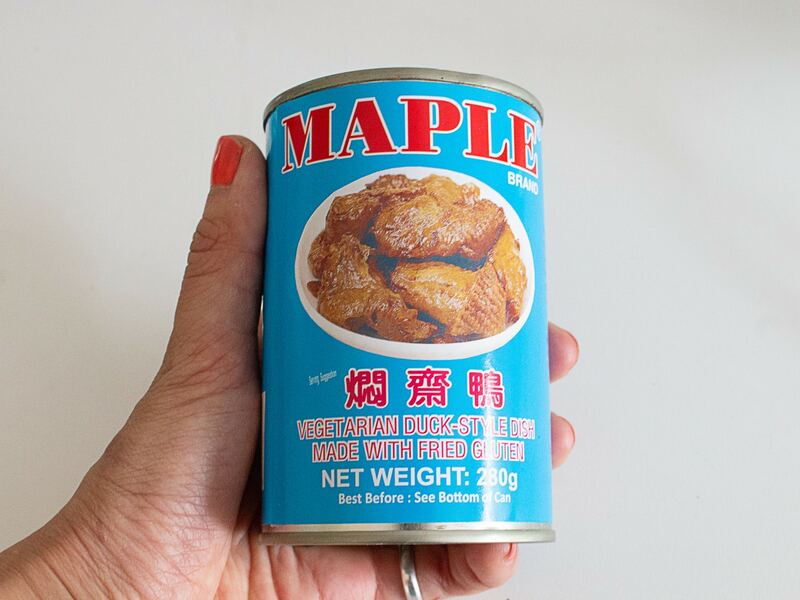 You can easily get a tin of mock duck from an oriental supermarket. Most oriental supermarkets have mock duck and chicken in the same brand. The mock duck’s texture and taste are better for this recipe but if they only have the chicken, it will do the trick as well. If you are soy intolerant or don’t like mock meat you can replace the mock duck with pulled jackfruit. It tastes delicious as well. To make rolling your pancakes as easy as possible, you need to shred the spring onion into really thin strips that are about 2-3mm wide and 4-5cm long. Cut out the seeds from the cucumber and slice that into strips that are about 1cm wide and 4-5cm long. Place the shredded spring onion and cucumber on a serving plate and set aside. It may take you while to slice the salad so thinly, especially if you’re not great at cutting, but be patient… it’s definitely worth the extra effort. Get a Hoi Sin sauce from an oriental supermarket or even from the oriental aisle at your large regular supermarket. Hoi Sin is actually is a widely sold oriental sauce in the UK nowadays, probably because people love crispy duck so much here!!! Transfer the thinned Hoi Sin sauce in a small serving bowl and set aside. Drain the mock duck with a sieve, shaking to remove excess water, and then transfer to a chopping board and cut into pieces about 1-2 cm thick. Heat the olive oil in a large, non-stick frying pan, add the mock duck and fry for 5 minutes until it turns golden. Then transfer to a serving dish and set aside. Steam the pancakes in a steamer for 3-5 minutes or heat in the microwave 30- 60 seconds until soft. Don’t heat the pancakes longer than the time suggested as they may begin to stick together. 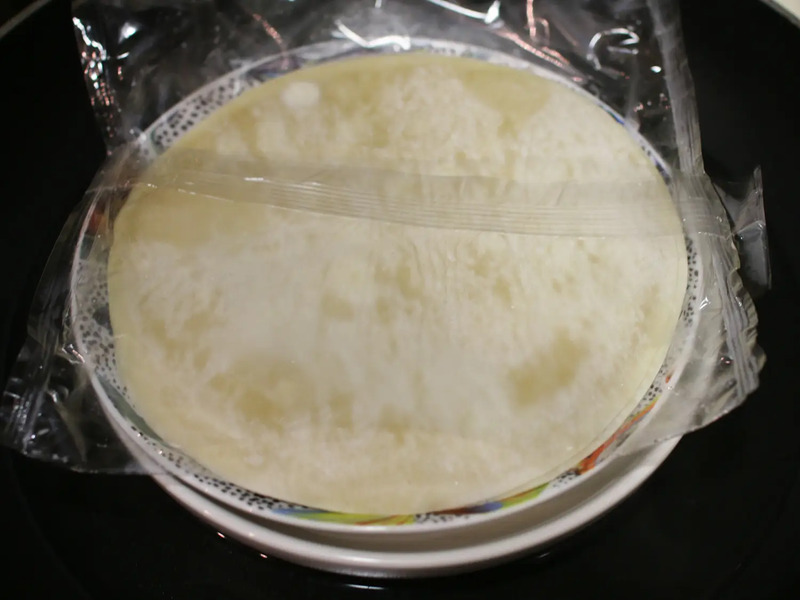 It is ok to leave the packaging on during microwave heating(not more than the suggested time above) as it will keep the pancakes moist. Once everything is ready. Place the heated pancakes, salad, sauce and crispy ‘duck’ in their own bowls/on their own plates and serve. Try to keep the pancakes covered all the time because they will dry out pretty fast. Your wraps will taste much nicer when the pancakes are soft and warm. 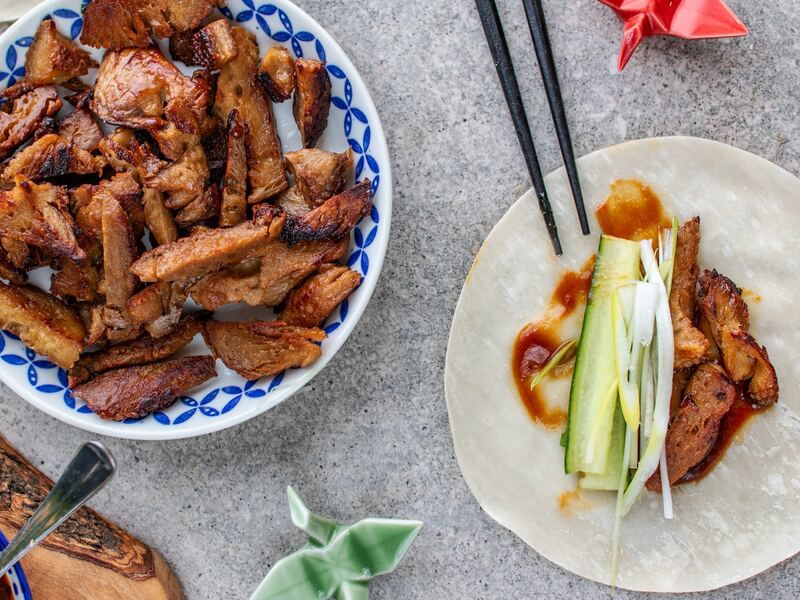 This dish satisfies your meat and takeaway cravings at the same time! It is super easy to make and very fun to eat. You assemble each wrap yourself on the table and pass dishes around for everyone to enjoy. 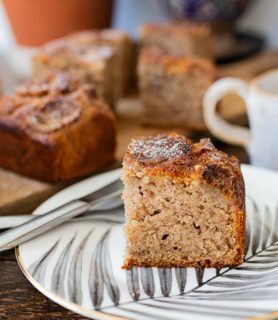 This ‘communal-style’ dish is a great way to share good food and nice conversation with friends and families. 3 spring onions, white part only, thinly sliced into 2-3 mm wide, 4-5 cm long strips. 1/2 cucumber, cut into 1 cm wide, 4-5 cm long strips. In a small serving bowl, mix 3 tablespoons Hoi Sin sauce with 1 tablespoon water, set aside. Drain the mock duck with a sieve, shaking to remove excess water then transfer to a chopping board and cut into 1-2cm thick strips. Heat the olive oil in a large, non-stick frying pan then add the mock duck and fry for 5 minutes until it turns golden. Transfer to a serving dish, set aside. Steam the pancakes in a steamer for 3-5 minutes until soft (or 30- 60 seconds in the microwave). 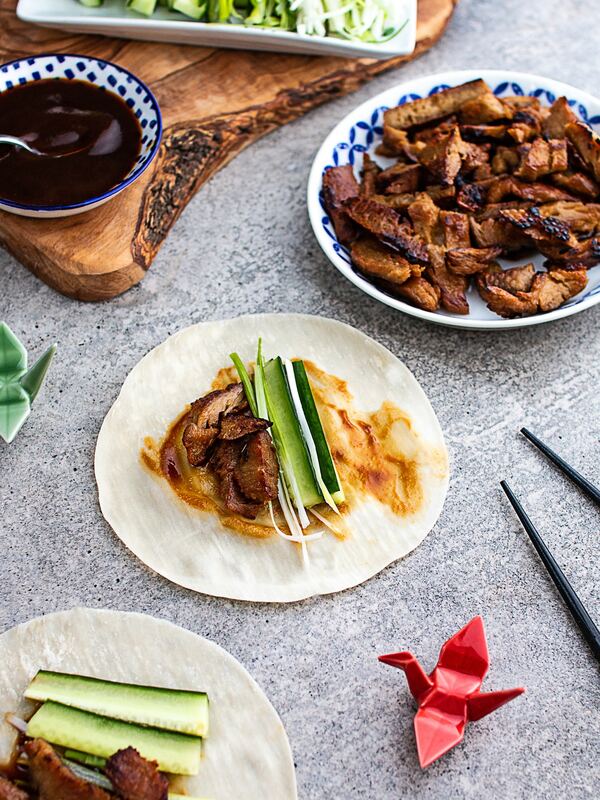 Serve your vegan crispy duck with Hoi Sin sauce, cucumber, spring onion and pancakes. * You can buy the mock duck from most oriental supermarkets, they have mock duck and chicken in the same brand. The mock duck's texture and taste are better for this recipe but if they only have the chicken, it will do the trick as well. ** Pancakes are sold in most oriental supermarkets as well, normally under the frozen section with dumplings, pastry and spring roll wraps. Or just ask the shop assistant for 'the pancakes for duck', they will know what are you looking for.